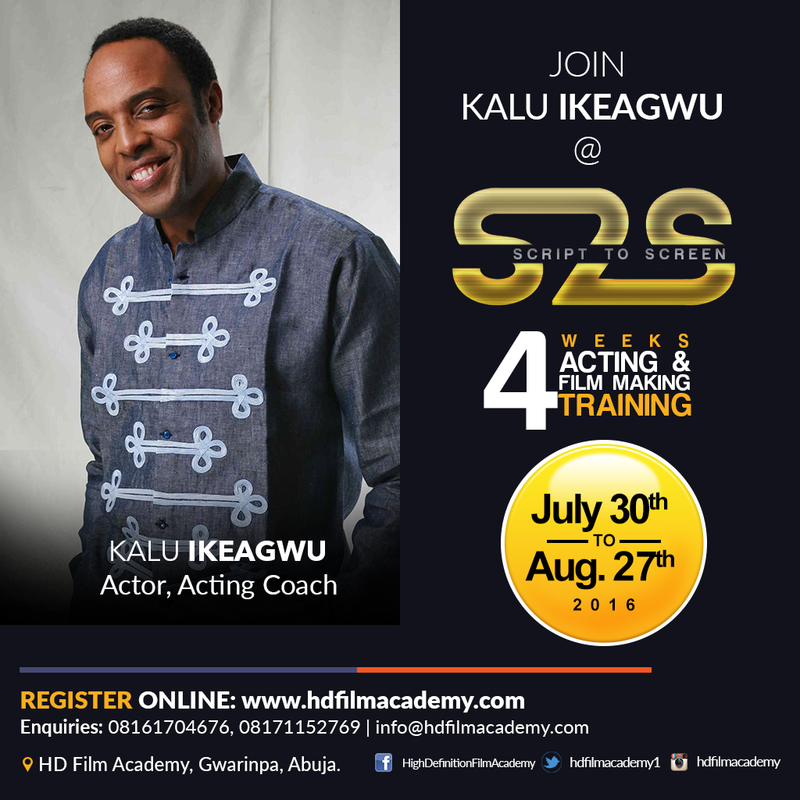 It Started out in 2012 and currently set for its 5th edition, Abuja’s foremost Acting and Filmmaking Academy and Nigeria’s top 5 film school, High Definition film Academy has just rolled out details for its summer acting and filmmaking training tagged “Project Script 2 Screen, 2016”(#HDFAS2S2016) – a four weeks intensive Acting and Filmmaking Training, Short Film Competition & Awards – with some ofNollywood’s finest movie icons: NseIkpeEtim, Blossom Chukwujekwu, Teco Benson, IshayaBako, KazeemBraimah and Bright Wonder Obasi as facilitators. 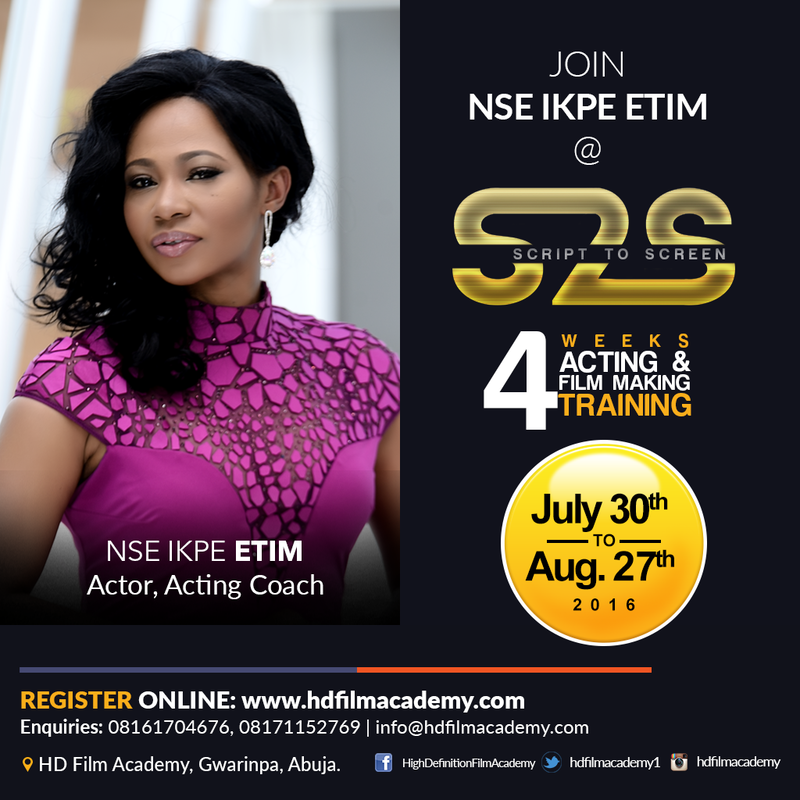 Courses availableinclude Acting, Screenwriting, Directing, Cinematography, Editing, Photography, 3D Animation and Special Effect Makeup. 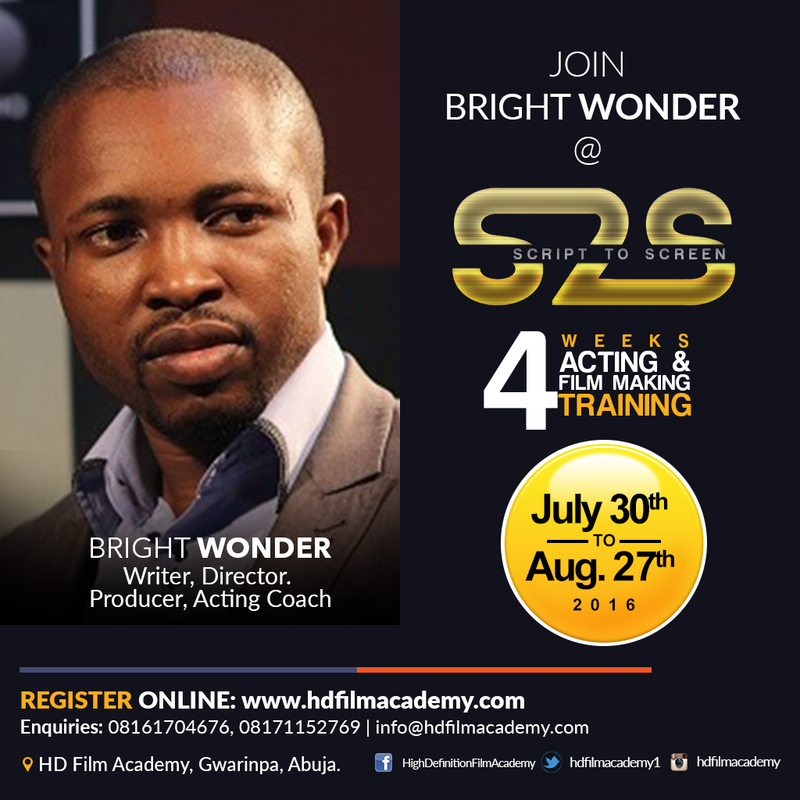 S2S 2016 Project is set to commence with a welcome reception on Saturday, July 30, 2016at HD Film Academy, Gwarimpa, Abuja. Lectures, training andshort film shoot follows suit from Monday, August 1, 2016 through Friday, August 26, 2016 while the closing ceremony and outstanding students’ awards will hold on the last day, Saturday, August 27, 2016. Accommodation plans have been considered, sorted and taken care of with regards persons attending the training from outside the FCT. 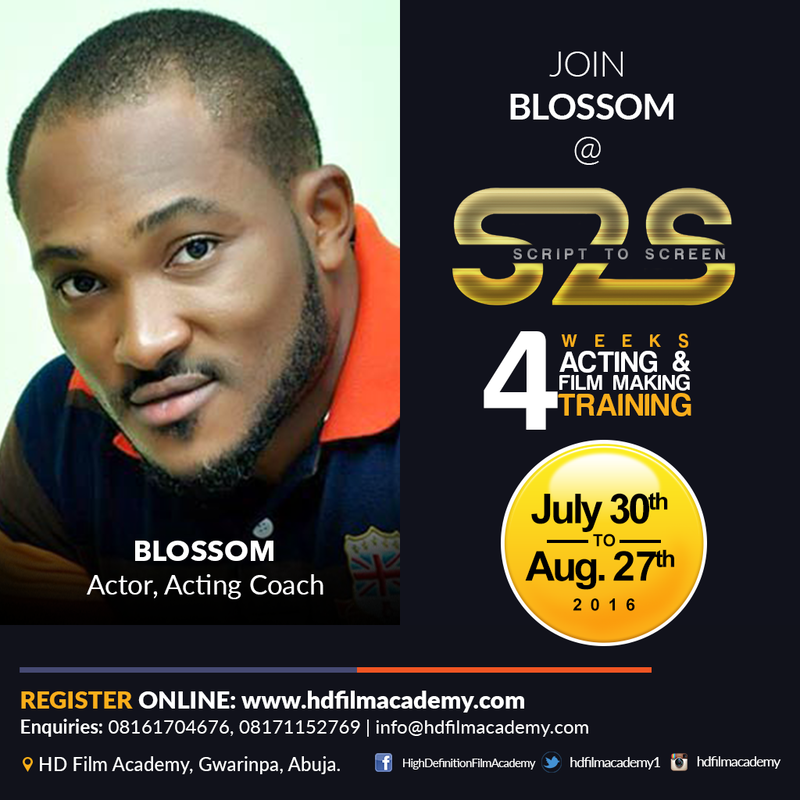 Registrations can be done via www.hdfilmacademy.com and for queries and enquiries, call 08161704676, 08171152769. Script 2 Screen, 2016… fire up your passion! Suite 6 & 7, 1st Floor Wing B, MIB Plaza Gwarinpa, Abuja. Participants shall be engaged in an Intensive Hands-on Training in any field of their choice for a period of two weeks. 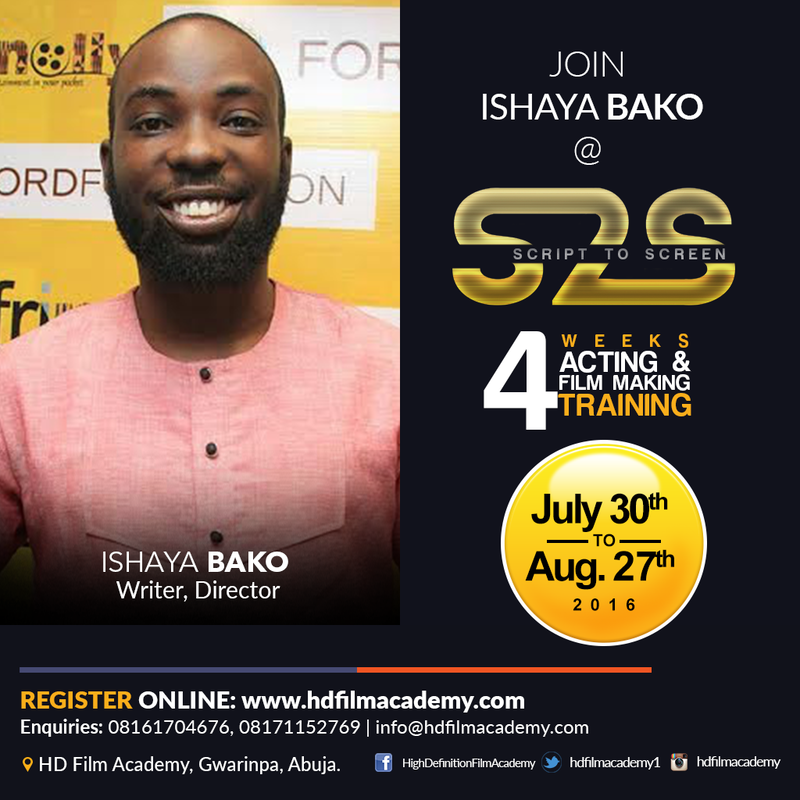 Training shall include both theory and practical, and from the first day of commencement of the project, participants will be guided to writing, shooting and directing their own films. Consequently upon the two weeks training period, participants shall be engaged for another two weeks in a short film competition, tactically designed to put them in a competitive environment to optimize their learning process thereby maximizing their potentials. During the competition process, participants will be divided into Ten Groups and each participant duly engaged in their area of training in other to produce a short film with their groups of between Ten to Fifteen minutes that will comparatively compete with the short films produced by other groups: Writers will write, Directors – direct, Cinematographers will shoot, Editors will edit, and so on. All short films to be produced will be primarily based on selected Social Related issues which include: Child Abuse, Human Trafficking, HIV/AIDS, Drug Abuse, Corruption, Malaria etc. 3. Awards: The Script to Screen four weeks Acting and Film-making Project shall climax with a screening of all Ten Short Films produced by the respective groups at a Red Carpet Première at Merit Award House, Maitama, Abuja. The Award Ceremony shall be graced by important personalities in the Film and Entertainment Industries, related International and National agencies, Private and Government Parastatals, and all specially invited individuals. Awards shall be given to the best participants in each category as determined by a panel of film-making professionals. See links to past script to screen Acting and Film-making training projects. 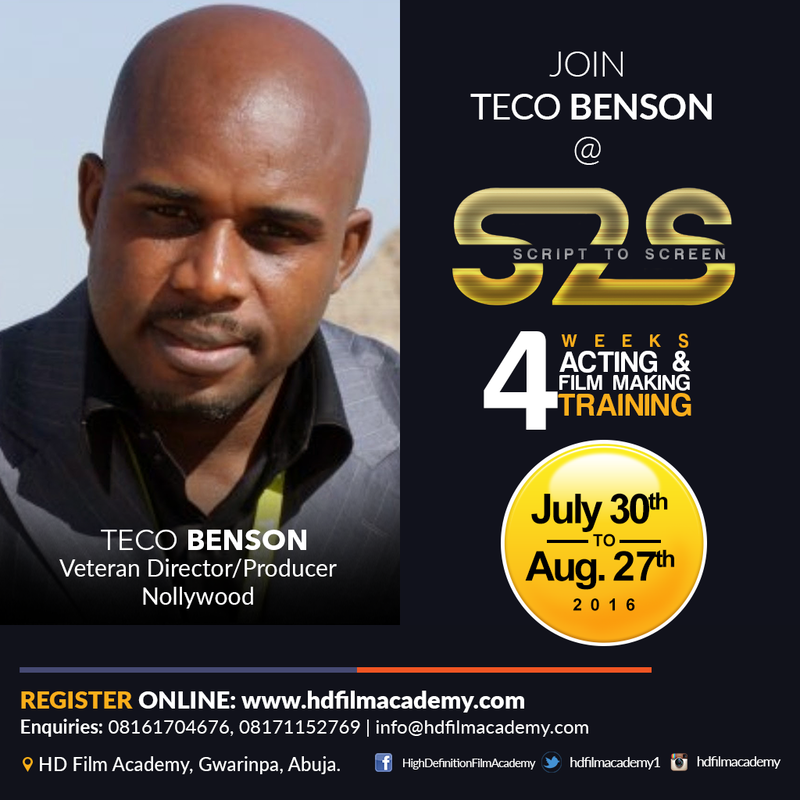 Script to Screen 2015… fire up your passion!